High-bit-rate Digital Subscriber Line (HDSL) technology is a transparent replacement for a T-1 repeatered line in the distribution plant. It allows DS-1 signals to be transported over distances of up to l 2,000 feet on copper cable without line repeaters. HDSL technology meets the existing tariffed T-1.403-1989 service interface. HDSL eliminates engineering time and reduces the cost and provisioning time associated with conditioning T-1 lines. Since HEIST automatically adjusts to gauge changes and bridged taps, it eliminates the rearrangement of local loop facilities. It is designed to operate in the presence of near-end crosstalk (NEXT), which means binder group separation is not necessary. 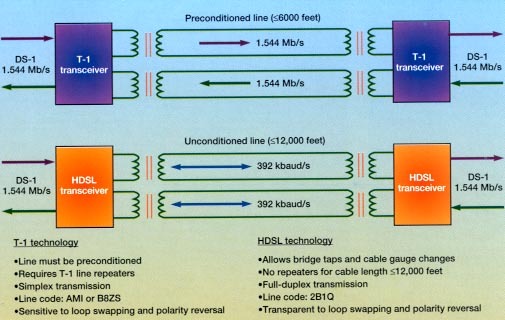 HDSL uses two-pair copper cable for full-duplex transmission, using echo cancellation with each pair carrying 784 kb/s. The lower bit rate allows for a lower frequency range of operation that reduces channel loss and NEXT. HDSIL technology meets the Bellcore line coding standard 2810 (two binary one quaternary) as defined by Bellcore TA-210, a four-level pulse amplitude modulation scheme. The power spectrum, NEXT performance, echo cancellation and adaptive filtering properties of the technology optimize transport of high-capacity services over copper lines meeting customer serving area guidelines without compromising existing services. By SEAN MARTIN with ADC Telecomm. High-bit-rate Digital Subscriber Line (HDSL) technology is more than a passing fancy on the road to public network fiberization. It will be a companion on the local exchange carriers' journey toward an all-fiber network by enhancing the value of the copper infrastructure and making it a viable and profitable transport medium for high-capacity services. Businesses are becoming more sophisticated as their use of technologies such as facsimile, local area networks, imaging, videoconferencing, T-1 video and computer-aided design for engineering, commercial art and other graphic disciplines increases. This expansion is putting pressure on LECs to deliver high-quality transmission services that are reliable and always available. With access to high-capacity services possible over existing copper, a forward-looking telco can put its expansion resources into deploying fiber into new territory, in areas where copper's capacity has been maximized and in locations where it is more cost-effective to deploy new fiber than to rehabilitate the copper plant. As opportunities grow to offer new and varied high-capacity services, many service providers are studying multimedia network architectures based on the synchronous optical network. This architecture is appealing to telcos because a single access/transport platform will offer maximum flexibility to deliver the services users value most. There is fierce competition among service providers in metropolitan areas. Most customers are impatient about the long provisioning intervals for services that typically can be provided over conditioned copper T-I lines. The majority of these customers need only access and transport because the high-capacity services come to them from an interexchange carrier through the LEC. The major service providers have tight budgets and shrinking human resources to manage and deliver service. The current medium in the local loop is copper, and it is likely to remain that way for some time. Neither customers nor regulators will allow carriers to pass on, with any significance, the additional expense of duplicating an already existing copper network with fiber. Because HDSL is an electronic technology that eliminates the need for conditioned lines, it is an excellent solution to these problems. Using existing technologies, lines have to be conditioned by the separation of transmit and receive pairs, removal of bridge taps and addition of line repeaters. HDSL is particularly attractive since approximately 85% of the local loops nationwide are within the customer serving area (CSA) guidelines of up to 12,000 feet and represent well-entrenched copper infrastructure. When repeaters are eliminated, minimal administration and maintenance is necessary. HDSL also provides virtually error-free service without repeaters. Provisioning only requires installing the HDSL transmission equipment at the central office and the demarcation point of the customer premises without intermediate regenerators. By using the existing copper in the local loop, HDSL technology helps telcos simplify provisioning for quick and easy installation; provide an intelligent network interface, which reduces support and maintenance staffing; and deliver revenue-generating high-capacity service over copper as they fiberize the local loop and as the 'migrate to ONET-based net work architectures. With advances in very large scale integration, DS-1 service over non-loaded copper can be provisioned as easily and cost-effectively as fiber, using HDSI, technology (Figure 1). Ameritech, Bell Atlantic, BellSouth, GTE, Pacific Bell, Southern New England Telephone and Southwestern Bell are industry leaders in deploying HDSL. BellSouth plans to use HDSL technology to replace repeatered lines and considers it a potential means to deliver fractional T-1 service. Ameritech plans to deploy HDSL technology that also offers remote surveillance and provisioning capabilities. In addition, several LECs have tariffed fractional T-1 services in anticipation of HDSL's ability to lower provisioning costs. Other future services being considered loop carrier services from the CO over copper to a remote site for distribution to users. And, with the growth of cellular services, some telcos are looking at HDSL as a viable way to connect cell sites using copper T-1 lines. Some users are even weighing the benefits of using HDSL technology to connect their own LANs. As HDSL equipment is installed as stand-alone equipment, service providers will expect future generations of the product to be integrated into a SONET-based multimedia network without having to "forklift" equipment out of the network. As a result, embedded copper will continue to serve highcapacity customers where copper is the most appropriate medium for the services required. In turn, capital then is made available for fiber deployment and other network improvements (Figure 2). HDSL is an important breakthrough technology that is currently in the eatIy, stages of it, evolution, but it is not the ultimate solution for all high-capacity applications. When compared to fiber, copper's main advantage is that it provides power in the local loop. For example, the finite bandwidth and range limitations of copper confine HDSL's applications to within less than 12,000 feet. This is not really a problem, though, since the majority of local loops nationwide meet CSA guidelines. HDSL clearly has more benefits than limitations.